Frying an egg on the sidewalk during summer isn’t an expression in Texas, it’s simply quicker than heating up the pan. These extreme temps affect more than just our electricity bill. Our pets can suffer tremendously in the summertime heat. 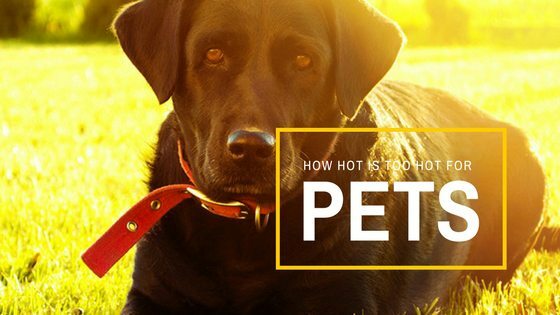 So how hot is too hot for pets? 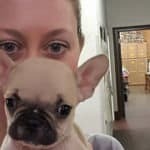 While it depends on your specific animal and their breed, generally with lots of water, circulation of air, and shade, most pets will be fine in temperatures up to 90 degrees. But please remember there are no hard and fast rules here. Dogs don’t sweat. They cool off by panting. If it’s hot enough, no amount of panting will cool them down. In addition, it really depends on your dog. Short-snouted dogs don’t cool off nearly as easily through panting. Additionally, dogs whose breed originated in cooler climates like Newfoundlands and Huskies, usually have a more difficult time adjusting to warmer temperatures. The safe bet to avoid overheating and a possible heat stroke is to keep your pets out of the heat, but there are a number of other steps you can take. 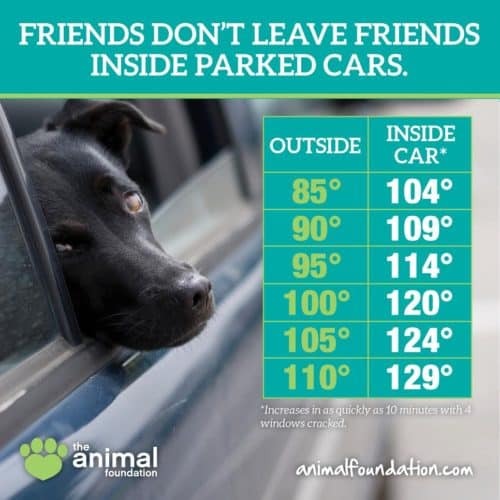 A dog in the car is a really good way to get your broken window: The temperature inside a car will reach 104 degrees in ten minutes on just an 85-degree day, even with the windows cracked. I know many animal lovers, myself included, that wouldn’t hesitate to break a window if a dog is in distress. Just don’t do it! Fried egg versus Fried Paw Pad: If it is 77 degrees outside on a sunny day, the asphalt will be 125 degrees. You can fry an egg at 131 degrees so a good rule of thumb is if you cannot leave the back of your hand comfortably on the sidewalk for 11 seconds, it’s too hot to walk your dog. Go for walks in the morning before the sun has had time to heat the pavement. Made in the shade: Pets need access to shade in the summer. Hopefully, you can bring your pets inside during the hottest times of the day but if not, at least make sure they have adequate shade and fresh, clean drinking water. A dog house is not shade in the summer. It is an oven. Good shade is typically open on all or at least 3 sides to allow for ventilation but covered on top. Keep in mind the setting and rising sun when creating the perfect shady spots for your pets. You may need 2 shady areas, one in the morning and one in the afternoon, to properly protect your pet. Water, Water, Water: Fresh, clean drinking water is crucial to your pets surviving the summer heat waves. 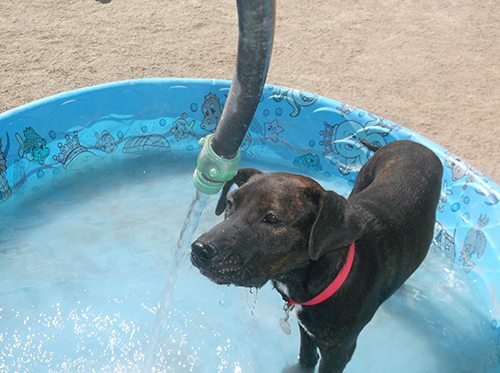 In addition to drinking water, a small kiddie pool can be quite refreshing and provide your pet with much-needed relief. To cut or not to cut: It’s important to remember that pets have a natural cooling system built right in their bodies. Our instinct may be to remove their thick fur coats in the summertime but doing so may actually do more harm than good. Shaving your pet exposes her skin to the sun that would otherwise be protected. Their fur blocks the sun and helps them stay cool. It is important to diligently brush and thin the undercoat during the summer time but summer haircuts should be professionally done and kept long enough to leave your pets’ natural cooling system intact. See this ASPCA article for more information about why you shouldn’t shave your pet. Summer time doesn’t have to be miserable or fatal for your pets. Follow these safety tips and help keep your pet safe in the summer heat. When it’s at or above 90 degrees outside, it’s important to watch for signs of a heat stroke in your pets. This is especially true for dogs who are very young, old, overweight, not used to a lot of exercise, have any heart conditions, or those with short muzzles. So what are the signs of heat stroke? If you notice any of these symptoms during hot weather, move your pet immediately into the shade or air conditioning. Apply cold towels and/or ice packs to their chest, neck, and head, and run cool water over them. Let them lick ice cubes or drink a small amount of water. 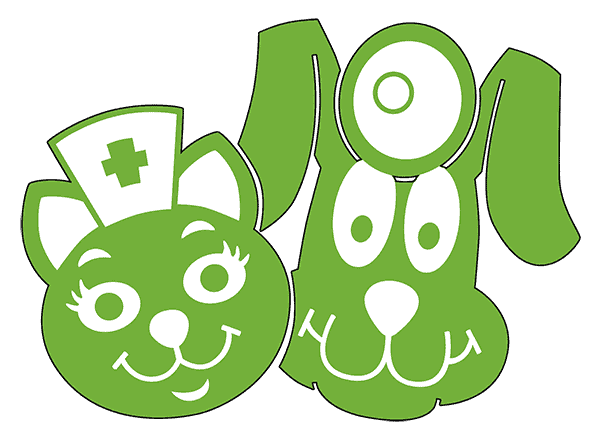 Take them directly to your veterinarian or an emergency vet.